Greece is being forced into an austerity program in order to be able to continue to borrow money. But it has come with a cost. Unemployment is now at 12.6%, up from less than 7% just two years ago. And Greek GDP continues to slide. Back in January 2010 Iceland had 9% unemployment. By January 2011 it had fallen to 8.5% (which was when I did the earlier post.) Now (Jan. 2013) it’s 5.5%, or 5.8%, depending on the source. To say Icelandic data is a challenge would be an understatement. I do know that the number of unemployed is 8686 people, FWIW. Of course Greek unemployment is now over 26%. We have, however, concentrated on our recovery, and paradoxically, what we are seeing in the last two years is that many sectors in Iceland: the energy sector, the tourism sector, the IT sector, the manufacturing sector, and the fishing sector are doing better in the last two years than they did prior to the banking crisis. And you might also find it interesting that the collapse of the banks revealed to us a very interesting aspect of modern banking, which I think has been more or less overlooked in this discussion in Europe and in America in the last two or three years: the Icelandic banks, like all modern big banks in Europe and America and all the other parts of the world, are no longer banks in the old-fashioned way. They have become high-tech companies. High-ranked engineers, mathematicians, computer scientists, programmers and so on and so forth. And their success depends largely on how successful they are in hiring people with this education and capability, not necessarily those trained in business schools or finance, but in engineering, mathematics, computer science and so on. And when the Icelandic banks collapsed, what we saw was that a great number of companies in these creative sectors, IT, high-tech, and all of those, who had the large growth potential in the previous years, but had not been able to realize it because they couldn’t get the people, due to the fact that the banks were buying up all the best engineers and mathematicians and computer scientists, suddenly had the pool of talent available to them. And within six months, all these people who came out of the banks with these qualifications had been hired. So since then you have seen a great growth period in the Icelandic IT sector, the high-tech sector, the manufacturing sector, because they could suddenly get the engineers, the mathematicians, the computer scientists. I worried that the low unemployment rate might have reflected emigration, but Iceland’s net migration is still positive. Nonetheless the labor force shows some wild gyrations; from 156,000 in “normal” 2004 (3% unemployment) to 178,000 in booming 2008 (1% unemployment) to 169,000 in 2012 (6% unemployment). Given that population growth is under 1%, the growth from 2004 to 2012 exceeds the rate of population growth. It seems like in 2008 every available body was working. In any case, those who follow the country suggest the employment situation is much better than the failed eurozone, and I have no reason to doubt those stories. By comparison, the US, which has almost exactly 1000 times Iceland’s population, has over 12 million unemployed and only 143 million employed. Real salaries are down by around a third since the crisis. And the same article suggests that capital controls have held back the recovery. Indeed there is so much pessimism that the right wing party is likely to regain power in the next election, with promises to cut taxes. Here’s my best guess as to what happened. There has been relatively little RGDP growth since 2009. But the key variables for the labor market are NGDP and nominal wages. Because nominal wages are sticky, the relatively strong NGDP growth reduced unemployment from 9% to 5.8%. If Iceland was in the eurozone its NGDP would have fallen sharply after 2007, instead of rising sharply. Perhaps unemployment would be 5.8% in any case—if the RBC model is correct—but how many countries in Europe with collapsing NGDP have low unemployment? More likely the RBC model is not correct. Low real wages are far from ideal, but there are much worse things that falling real wages. And Greece, Spain, Portugal, Italy and Ireland have them. I admit Iceland is too small to draw any sweeping conclusions, but since this country got a lot of attention a couple years ago, I thought it worth re-examining in the light of a couple more years of Icelandic data, and also eurozone data. Many people have noted that British real GDP growth has been very low since 2010. Yet its unemployment rate has actually done fairly well, at least compared to the eurozone. My hunch is that Britain’s unemployment rate has done better than the eurozone because it has faster NGDP growth, and its unemployment rate has done worse than Iceland’s because its NGDP growth has been slower. But Iceland would have to be much bigger for me to have confidence in that claim. PS. Some suggest that the NGDP–employment link is a sort of tautology. That would be true if all countries targeted inflation at 2%. But Iceland let inflation soar in 2008-09, which is why NGDP rose despite a plunge in RGDP. PPS. Off topic, a few days ago I suggested the GOP would cave. They’ve already started pushing for spending increases. And now the “small government” GOP wants the government to insure housing finance. How long before they cave on the minimum wage? PPPS. This is what happens when you wait 24 hours to put up a post–Marcus Nunes beat me to it. This entry was posted on March 05th, 2013 and is filed under Misc., Monetary Policy. You can follow any responses to this entry through the RSS 2.0 feed. You can leave a response or Trackback from your own site. Ireland was chosen because it´s the closest in size to Iceland. Like comparing apples in different “orchads”, one well irrigated, the other under a dry spell and lacking irrigation. This helps illustrates why structural problems of unemployment are overblown. IF wages fall enough to make retraining profitable the ‘structural’ problems don’t matter as much as the VSPs suggest. This is also a perfect example of the importance of internal devaluation and just another reason the Euro is a disaster as long as a group of unelected technocrats use monetary policy as a bludgeon to reform countries internal systems. If you had stable NGDP growth in the Euro area the nations who made the right reforms will devalue, certain countries who have good government and efficient workers will have some inflation, and the countries who refuse the necessary labor market reforms will have both inflation and structural issues. Interesting! Especially the part about skilled labor being redirected into other sectors. From what I’ve read in the papers (and seen anecdotally), there have been pretty large workforce reductions among many of the big US banks as well. It would be nice if we saw a similar re-alignment. It is also interesting to compare the case of iceland against the case of latvia, which pegged its currency to the euro? Their story is (at least directly compared to greece, spain, …) a success story, despite what Paul Krugman has to say about it. The recovery in latvia began in 2010 after NGDP started to grow again. But this was (as far as I understand it) *not* achieved via monetary policy, but by extrem supply side reforms, which let to a reversal of the panicaly capital outflows. Their current unemployment rate is now somewhere at 11% or so, which is not that high if you take the structural unemployment rate in latvia into account, which according to the IMF is nearly as high. 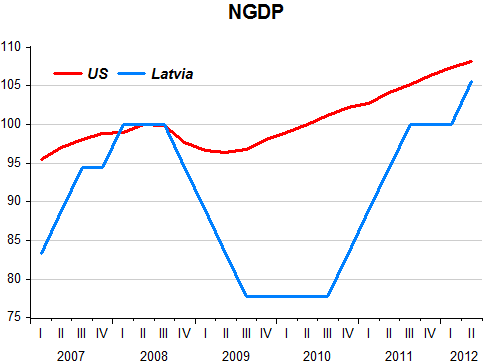 Latvias GDP is now approximately at it’s 2008 level and rising fast. “Off topic, a few days ago I suggested the GOP would cave.” Irrelevant; you implied they would cave by the sequester deadline, and they didn’t. Eventually, anything will happen; you can’t just keep predicting the same thing and claim credit only when it finally happens. “They’ve already started pushing for spending increases.” There’s one, off-hand, mention of a (singular) “spending increase” in your link; it’s a (trivial) re-direction of savings from reducing Iraq and Afghanistan spending and it’s not actually clear if it’s an increase over 2012 levels or over sequestration levels (which are themselves increases over 2012 spending levels, despite media reports). “And now the “small government” GOP wants the government to insure housing finance.” Because being “small government” means opposing any and all policy reforms other than cuts, even when they don’t actually result in bigger government. Might as well say “and now the ‘small government’ GOP wants the government to pay students’ tuition at private schools”. It’s not just the NGDP targeting thing. Iceland let the banks fail, they didn’t impose the kind of austerity you’re seeing in Europe, they took care of their citizens, and they liquidated the junk debt. Of course, adjustments via currency devaluations are far less painful than ones through nominal wage deflation. I’d also like to add one more point about the capital controls Iceland introduced. Iceland has 300,000 people, so a large fund/bank could take down Iceland with a large bet. It’s size could make it very vulnerable to attacks of that kind. Note: I have no problem with speculators, I actually think speculation is necessary in the markets and speculators provide a very valuable role. However, the sheer size of Iceland is what may make it vulnerable. What would Ken Rogoff say? Isn’t this supposedly impossible in the wake of a ‘financial’ recession? The bit about redirection of labor was really interesting. I have always thought that the biggest problem by far with TBTF in the U.S. is that it creates artificially high profits and high wages in the financial sector so that the all the smartest and hardest working young people go into banking instead of other businesses. I wish Liaquat Ahmed’s Lords of Finance (2009) was released earlier. Any politician reading that would have a visceral idea of what a disaster post-WWI deflation was for Britain vs. the countries that devalued (France, kind of). Of course, one would also hope Eurocrats actually knew their financial history, though they somehow delude themselves into thinking that devaluation is ‘irresponsible’. If I had to capture this whole mess in one sentence, it’s thinking that devaluation, not the underlying behavior that requires it, is irresponsible. History will view the Eurocrats today just the same as it views apologists of the gold standard. (1) The president’s description of all those bankers losing their jobs and then quickly finding high-paying employment in the tech and manufacturing sectors WITHIN SIX MONTHS is wonderful and extraordinary. But the president might be exaggerating. More research needs to be done on what happened there. (2) Unfortunately, the president does not make the connection himself between currency devaluation and the fact that employment in the tech / manufacturing sectors boomed. The way he tells it, those sectors were somehow “pent up” and once the banks were allowed to fail, tech and manufacturing naturally flourished. I think that that idea is totally bogus. Why should allowing banks to fail, ceteris paribus, encourage an employment boom? No, the key was the enormous devaluation of the currency. That kept national spending and thus employment going. Why do you think the president doesn’t make the connection with currency devaluation? Does he not understand it? Or does he just not want to remind Icelanders of the devaluation, which to some of them might have felt pretty painful. (3) Not enough attention is being paid to the fact that the bulk of Iceland’s devaluation happened in EARLY 2008 BEFORE Lehman Brothers. Why did investors lose confidence in Iceland’s financial sector so long before financial busts hit other countries? And in 2008, was Iceland’s devaluation an involuntary thing? Could Iceland’s government have even stopped the devaluation from stopping if it had wanted to? Thanks for your help so far, everyone! The same reason why a badly run company that is restructured can have greater success going forward? Marcus and Errorr, Good points. Sven, I agree that Latvia has done some good structural reforms. But I think Marcus is right—Ireland is the closest comparison. Similar per capital GDPs, small populations, neoliberal policy mix, etc. And Iceland’s clearly done better. I should say neoliberal compared to Greece–Iceland does have temporary capital controls. Jonathan, That’s absurd!!! I never claimed they’d cave before the deadline, everyone knew that wasn’t going to happen, there weren’t even serious negotiations underway. Sometimes commenters just make my eyes roll with their absurdity. As far as the GOP, just look at Bush’s 8 years. Small government? Don’t make me laugh. TravisV, Thanks. And good questions. Regarding the small goverment idea, I understand that Republican voters want smaller government. I don’t understand why they vote for Republicans. The Republican party establishment is a completely corrupt entity with no actual political aspirations (except for perhaps the neoconservative foreign policy branch). Your alternative in primaries are generally astroturf tea party goofballs. And yes, they will try to deliver small government. But because they don’t have the slightest clue what they are doing, they give you stuff like threat of a debt default. Is that really worth it? You have essentially the same problem that left/liberals have (except that leftists don’t even have the left equivalent of tea partiers). You don’t have a party infrastructure that reflects your policy priorities. You need to either rebuild the Republican establishment so that you can get competent people in office advancing your policy priorities, or stop voting for the cynical jerkoffs who have hijacked the Republican party over the last 30 years. Those bankers might have had awesome brain power. But they couldn’t have revolutionized those tech companies within a span of six months. Secondly, exactly what “restructuring” elements do you think encouraged an employment boom in the short-run? The banks weren’t generally restructured. They were just eliminated. And if you think about the tech companies, they didn’t restructure by firing low-value employees and replacing them with bankers. No, employment in that sector grew dramatically. The tech companies were able to employ BOTH the bankers and low-value employees. That is an extraordinary thing. The only way that that could have possibly happened in the short-run is that there was a dramatic surge in demand for Iceland’s tech products. And why did demand surge? Their currency lost 40%+ of its value. Iceland allowed its banks to defaut on thier debts to foreign creditors. Ireland guranteed the debts to foreign creditors. Bad debt impedes a recovery. Iceland controls its own monitary policy. The PIIGS do not. Something that I have brought up atthis site before, even if the ECB were to engage in a massive quantitative easing, there is no indication that easy money flows to each country equally. e.g. Money supply (M2) is Growing at 4.4% over the eurozone, but is contracting at 3.4% in Greece. No one wants to lend to Greece and Greek banks are starved for capital. And, so long a rumors perist that Greece may leave the Euro, why would anyone lend money to Greece? Tech companies can flourish more if their financiers are in better shape. I am not saying letting the banks fail was the sole requirement to turning the country around. Just that I think it helped. More than the anti-liquidationists care to admit at least. The foreign part of banks were eliminated. The domestic part was nationalized. Which parts encouraged the boom? All those elements that got liquidated due to lack of government rescue, helped. I don’t believe there isn’t one set of elements that excludes other elements. I don’t think praising expansion for expansion’s sake is a responsible nor a pro-economic science approach in thinking about economies. Perhaps the resources and labor allocated to those tech expansions were more highly valued and urgently needed elsewhere by consumers, but they couldn’t be allocated in these deployments because of the signals that the massive monetary depreciation sent to investors, which of course are not signals of relative consumer valuations. There is a tacit value judgment in your praise of the tech expansion. It is subjective. It has to be considered alongside everyone else’s subjective judgments. Suppose the year is 1999, and the place is silicon valley. Suppose you saw in the US an additional expansion in the tech sector. Would you think it is wise, knowing what you know now, to tacitly praise it? To thank the central bank chairman for depreciating the dollar and encouraging the tech boom? You ought to be way more on your guard with the tech expansion in Iceland. It’s good now, but it could end terribly. Nobody likes to lose their jobs. And I don’t think promising workers that aggregate spending won’t fall is going to guarantee that they won’t experience hardships. I am more concerned about depreciating currency influenced booms than perhaps you are, because I don’t like wasting resources and giving people false hopes. You’ll get the likely response that Greece should leave the Euro and that the Greek government should impose a national currency. I agree with that call for money decentralization. I just think it should go further, to whatever extent market participants want it to go. If stopping arbitrarily by force at the level of Europe is bad, then so is stopping arbitrarily by force at the level of Greece, just less bad. If NGDP targeting is adopted, will MMs start talking about central bank abolition? Or will they take advantage of the intellectual environment and accept any cushy job offers to run it? I won’t hold my breath, hehe. If I were making my recommendations to the finance ministers in Greece, I would tell them to default on their debts and stay in the Euro. The problem is that you’re saying there’s a strong link between bubbles (malinvestment, maybe?) and monetary policy. And there simply isn’t much of a link at all. Dude, the evidence is overwhelming. You’re just not looking at the right data, that’s all. A much larger aspect of the economy was in a bubble during both of these times. We just didn’t observe the other sectors collapsing in the same way, because the Fed reinflated before that could take place. So we’re here talking about “tech bubbles” and “real estate bubbles”, when these are really tips of the iceberg. Yglesias does not understand bubbles. How much of today’s technology got its start during the tech bubble, I wonder. It seems to me that the concept of “malinvestment” is too linear, at least as interpreted by many. Krugman straw manned the theory, and showed he doesn’t understand it (see David Gordon, Robert Murphy, Robert Wenzel, and a host of others who study “the hang-over theory” for where Krugman went wrong). The fact that Yglesias considers Krugman’s piece a “comprehensive takedown” just shows he doesn’t understand bubbles either. The theory Yglesias is criticizing doesn’t imply or presume “no factories at all” as the more optimal alternative. All in all a really flawed article. The fact that you think it’s a good article shows that you too don’t understand bubbles. I see a distinct pattern here. Seems every pundit who criticizes the “hang-over theory”, don’t even understand it. Always take into account the unseen. Don’t just focus on the seen. Think about Prof. Sumner’s preferred policy of 4.5% NGDPLT. Do you think we’d get bigger bubbles over the long run under that regime than we’d get if the Fed adhered to a gold standard? Why? What is the link between monetary policy rules and bubbles? What is the huge thing about bubbles that you understand that the rest of us are missing? Who knows? Can’t assume that the unseen grass is always greener. Bubbles aren’t made or prevented on the basis of what happens to NGDP. Monetary policy that brings about capital intensive projects that require more resources than actually exist, or will exist over the project’s lifespan. This is done via bringing down interest rates below what they otherwise would have been in the absence of monetary policy. That bubbles are comprised of real concepts, not nominal ones. They have to do with capital allocation. No, but we also can’t assume it’s browner either. But having the choice to pick where you want to stand, has value in itself. Your claim that “the evidence is overwhelming” is ridiculous. Think about the 70 or 80 years prior to 1929, when the government adhered to a gold standard. Inflation was incredibly low. But still, huge asset bubbles happened all the time. And that period ended with one of the largest “bubbles” ever: the stock market boom. And that “bubble” happened even though inflation during the 1920’s was very low. Think about the rapid rate of inflation the Fed embraced throughout the 1970’s. Did that result in any gigantic bubbles? No, much larger bubbles developed even though inflation was much lower in 1987, 1999 and 2006. This is more nonsense. Geoff, you seem to believe that Bernanke is pushing T-bill interest rates to artificially low levels. That is exactly wrong. If the Fed surprised markets by tightening monetary policy, T-bill rates would go DOWN, not up. Bernanke has been saying this over and over the past few weeks and using lots of evidence to back up his case. If we tried to raise interest rates to three, four or five percent while the economy is still weak, it could not be sustained. Our economy is not strong enough to sustain real high real returns to savers. If we tried to do that we would throw our economy back into recession and we would have low interest rates like the Japanese do. The only way to get interest rates up for savers is to get a strong recovery. And the only way to get a strong recovery is to provide adequate support to the recovery. So I don’t agree with that premise. I don’t see deterioration, just the unease that sets in when you’ve won the argument. I think Prof. Sumner is just lamenting that he has less time on his hands these days and thus his posts aren’t quite as long and deep as they used to be. Which is perfectly alright. We should want Prof. Sumner to become as famous as possible, which would make him even more busy. If you actually click on the archives and read some of Prof. Sumner’s old posts, they’ll blow you away. Geoff, good luck educating these guys on basic economics. They all think the economy has to be managed and that bubbles are external events, not caused the very action they advocate (monetary policy). They are hopeless, just like poor Scott the central planner is. He understands absolutely nothing on the subject of economics and is just another inflationist schemer who thinks money printing is the path to wealth creation. You are tilting at windmills, friend. If “the evidence is overwhelming” that bubbles are primarily driven by monetary policy, could you please tell us what that evidence is? Thanks. I would say that the Fed should not be particularly concerned with bubbles. Bubbles grow; bubbles pop; things change; inovation happens. It wasn’t so long ago that “creative distruction” was a popular economic theory, but it is currently out of fashion. We shouldn’t be worried about bubbles, we should be worried about unsustainable expansions of debt. The problem with debt is that it is extremely fragilizing(for obvious reasons). When the debt can’t be paid back, there are ripple effects all over the economy. If you have equity, you don’t have those same ripple effects and liquidations don’t have to occur. The more I think about Geoff’s claim that he has a sophisticated understanding of bubbles, the more I smile. If a guy comes up to you and says he has an amazing ability to short bubbles in advance and make lots of money, make sure you hold on to your wallet! Your denial that the evidence is overwhelming is ridiculous. You mean during the not one but two national bank experiments, the cartelization and inflation from banks under the National Bank Act, and the issuance of unbacked Continentals and Greenbacks? You mean that “gold standard”? Don’t make me laugh. There’s knowledge of history, and then there’s what you want history to be in order to advance an agenda. Again, I already said bubbles ought not be understood as being created or prevented on the basis of what happens to price levels or aggregate spending. I don’t see how pointing my attention to price levels being low somehow undercuts what I am saying. See above. Never reason from a price change. Define “pushing”. If you mean he is ordering the rates lower by decree, then no, that’s not what I am saying. If you mean he is influencing money so that market participants are incentivized into lowering the rates, then yes, that is exactly what he has done. No, it’s exactly right. You’re exactly wrong. Claiming that the Fed has no effect over interest rates is perhaps the most ignorant statement anyone can say, let alone someone on a monetary policy blog! I didn’t say the Fed lowered interest rates in one and only one way. Straw man again. I said if and to the extent the Fed does lower rates below where they otherwise would have been without the Fed policy, then of course the Fed is responsible for those lower rates and that’s what the bubbles are based on, because it is interest rates that affect the allocation of capital in terms of when the final output is ready, and what degree of complimentary resources are needed to complete all the projects started. Bernanke has been wrong about virtually everything he has said about the economy since he began. The fact that you’re kowtowing to him only shows me that you are more concerned with power, politics, prestige and reverence, than you are with facts, truth, theory, and knowledge. This is perfectly consistent with bubbles forming on the basis of lower than market interest rates brought about by the central bank, and needing lower than market interest rates in order to stay afloat. Please note that by lower than market interest rates, I do not mean absolutely low interest rates. Never reason from interest rates (prices). You’re conflating real output growth, which lowers prices and does not increase nominal profitability and thus neither interest rates, with money supply and spending growth, which does. I don’t agree with the premise that inflation is always supportive, even if prices and NGDP are below what you believe they ought to be. Foolishness. It’s reasoning from price changes. Understanding bubbles includes understanding that one cannot scientifically predict where or when they will occur, nor when or where they will burst. Thanks for the snark though. Minds can always change, Greg. I guess I have more confidence in the power of reason than you do. First, the “evidence” I have in mind is not observable in historical data, at least for the last 100 years. The data does not exist. If bubbles are created by monetary policy that lowers interest rates below what they otherwise would have been in a free market, and we can’t observe anything other than central bank influenced interest rates, because the central bank won’t allow a free market experiment to run for any appreciable length of time, then I hope you can understand that the evidence is not observable. Second, the overwhelming evidence that I am referring to is purely theoretical, as all economic science should be (since we can’t observe economic counter-factuals nor run controlled experiments in the economy). You won’t be able to understand how bubbles form unless you first understand how the market works, which means absent of governmental monopoly, especially in money. If you can understand how a government imposed monopoly over water production, or oil production, or food production, could have destabilizing effects on the rest of the economy, then you would not be able to understand how a government imposed monopoly over money production could have destabilizing effects on the rest of the economy either. Economic bubbles don’t “just happen”. Economic laws change over time according to fads? You’re advocating that through capitulation? There are ripple effects with collapsing equity as well. Debt expansion is associated with monetary policy and bubbles. Don’t think they should be separated. More myths around about little Iceland than any other nation on earth. Iceland did everything they could to try and save the banks and only nationalised the banks because no one else would help them out. It was not a heroic Icelandic choice. The only problem with devaluation and high NGDP high coupled with low wage growth, is many loans are index-linked to CPI. Therefore, high NGDP with low wage growth will see debts rising. Iceland suffered an absolutely huge demand and supply shock. Therefore, real wages had to go down one way or another. One way to allow real wages to fall is (A) to devalue the currency. That way, the pain is spread out and full employment is restored. The other way of allowing real wages to fall is to (B) prop up the value of your currency (a la Ireland, Greece, Latvia, etc.) If you do that, then employers fire tons of their workers, you have mass unemployment and real output is depressed for years and years. Market Monetarists, Krugman and I think approach (A) is far preferable to approach (B). Do you agree with us? I agree devaluation of the currency is much the best option. However, the unusual situation in Iceland of having mortgages index-linked to CPI increases their debt burden. Moreover, foreign currency loans are an additional problem. I guess we will not get a true picture of Iceland until the capital controls are lifted. At least you agree about currency devaluation. I don’t dispute that it’s unfortunate that so many mortgages were indexed to CPI. (1) The president’s description of all those bankers losing their jobs and then quickly finding high-paying employment in the tech and manufacturing sectors WITHIN SIX MONTHS is wonderful and extraordinary. http://read.bi/VfRcWV But the president might be exaggerating. More research needs to be done on what happened there. (2) Unfortunately, the president does not make the connection himself between currency devaluation and the fact that employment in the tech / manufacturing sectors boomed. The way he tells it, those sectors were somehow “pent up” and once the banks were allowed to fail, tech and manufacturing naturally flourished. From a technical mechanical standpoint how exactly did the Sedlabanki accomplish this action. Your phrase implies that they “did” something. Is that the case or did they simply stand aside and let the market decline and then start running a peg at about the 125 ISK/USD level. And if that is the case, isn’t it a bit audacious for a tiny country which has just been wiped out to think it can defend a peg. I don’t get it. Question 2: So all this talk about Icelandic devaluation leads me over to the St Louis feds fred graphs , and they have one USD/ISK series,annual quotes from 1950 to 2010. Holy smokes , it looks like a misprint. The ISK has done nothing but decline for 60 years! At the end of Bretton Woods one USD buys one ISK. By 2000 it buys 100 ISK ! So help me figure this out, a tiny country with no arable land , completely dependent upon imports, grows from poverty to prosperity as it’s international buying power does nothing but decline. Can anyone explain this to me? mpowell, What makes you think the GOP voter wants small government? Doug, At the margin, more money is likely to flow into the weaker (more cyclical) economies. Cthorm, See Travis’s next comment, he also feels the earlier posts were better. Paul, Yes, Iceland has had a high trend rate of inflation. That implies consistent currency depreciation. At the margin, money will flow where there is the greatest perceived reward for risk. Money is allocated acording to perceptions of risk and return. Those perceptions can be ifluenced by short terms realizations of return or volatitlity. That is positive feed back, and that is the seed of a bubble. Add to that stakeholders with asymetric pay-offs and we get non-linear returns. I never said they should be separated, all I said is that debt bubbles are much worse than equity bubbles. Think about this from a balance sheet perspective, every balance sheet has assets and liabilities. If you increase your liabilities in order to purchase assets and the asset prices collapse, you’ve got a balance sheet problem. With equity, you’re still “poorer”, but there are no debts that have to be service; you won’t have as many bankruptcies and liquidations, and you don’t have the deflationary consequences of liquidating debt. Is that an economic law, and does that change? In the aggregate, increase liabilities how? Assume savings haven’t gone up much. Market participants expecting capital gains from rising asset prices buy assets on leverage. This creates a feedback mechanism between rising asset prices and leverage as debts rise relative to incomes on the aggregate. I’m not of the belief that savings create investment(I think it goes in the opposite direction). The problem comes in when market participants mistake consumption/quasi-consumption for “investment”(like houses or rising stock prices of companies with no sales, etc). There will always be market folly and stupid behavior by market participants, but the problem with debt is that the debts have to be serviced. If the debts cannot be serviced, they have to be liquidated–which can get you stuck in a debt deflation. One possible solution to this problem is the end of fractional reserve banking, which is what Irving Fisher proposed. However, in the world we live in, I think it’s essential for both regulators and central bankers to pay attention to credit growth relative to incomes. Yes, and if the policy is stimulative, that would obviously be the more cyclical economies. Right? Or what am I missing? Think in terms of unemployment. Will more jobs be created where there is mass unemployment, or where there is full employment? Will more jobs be created where there is mass unemployment, or where there is full employment? In Calfronia, less than 90 miles separates San Francisco from Stocton. We have moderate unemployment in the San Francisco and high unemployment in Stocton. One year from now, I expect unemployment to fall more in San Francisco than in Stockton. Where is the oportunity? What are the risks? Where will the money flow? Winners are rewarded for winning, which give them the resource to perpepuate their winning streak. The capitalist system has an inherent instability. Doug, On average, unemployment tends to fall more sharply in cyclical areas than non-cyclical areas during recoveries. I know nothing about Stocton, and thus cannot comment. Unemployment in North Dakota is 3%, I’d expect it to fall less in ND than in California and New York.